Far about 82 km from Hanoi capital to the south, Van Long Nature Reserve is situated in the north of Gia Vien District, Ninh Binh province. It was built by the Association of Forest Investigation and Zoning based on a community self-management model sponsored by the Embassy of the Netherlands in Vietnam. As the transition region between the plain and the mountainous region, the reserve retains the diverse and varied terrain, including a tropical forest ecosystem in karst and the vast system of marshes. Heaving rock islands standing in immense waters has turn Van Long into a unique complex and charming landscapes, a great potential land in Ninh Binh tourism. Van Long is now a bewitching attraction in Ninh Binh luring numerous both domestic and foreign tourists on the journey to discover Ninh Binh. Along with the Hoa Lu Ancient Capital, Tam Coc - Bich Dong, Cuc Phuong National Park..., Van Long Nature Reserve has now become a must-see spot for tourists to Ninh Binh travel. Tourists who come to admire the reserve will have the opportunity to view rich flora and fauna within the most bio-diversified wetland in Vietnam, according to research by national and international scientists. Standing on the top of Ba Chon, the highest mountain peak in the area, tourists can take a panoramic view of mountains endlessly stretching, valleys undulating, along with evergreen forests, peacefully tranquil villages, and verdant rice paddies. The scenery of the countryside is outstandingly majestic. Beside forest area mainly in the karst, Van Long also retains the largest system of wetland swamp in North Delta. It is considered as "the Bay of no wave" thanks to the immense waters adorned with wonderful grass and waterlily floating to the beat of wave. Enormous melaleuca forest tracts and countless white storks in the sunset much create an extremely capticating Van Long. Starting at Van Lam wharf, tourists can view the varied landscape of the Van Long wetland via basket boats. The natural scenery featuring imposing mountains and tranquil reservoirs offer peaceful surroundings that put tourists at ease. Floating in small basket boats, tourists have a chance to comfortably admire magnificent mountains, Chanh (Lemon) Cave, or windy Kem Tram. Tourists comfortably immerse immense and gentle waters and the fascinating image of colorful species of fish at the bottom. Going to Van Long, tourists not only admire the pristine beauty of the countryside, but also contemplate flocks of Delacour’s langur frolicking on the slopes of rugged cliffs, flocks of Sam Cam (a species of birds) always foraging, or hear the birds chirping and langurs howling each sunset. Notably, Fish Cave, the longest cave, is actually a breathtaking cave with its stalactites on the ceiling creating wonderful multi-shapes. Vân Long Nature Reserve is worth an engaging tourism spot in Ninh Bình. Not only having bestowed a stunning scenery, Van Long wetland is also preferred for the diversity of ecosystems. Along with two mainly, namely terrestrial ecosystems formed in Kaster and aquatic ecosystems formed in low-lying areas, the reserve comprises ecosystem of residential accommodation. Each brings its own characteristics, yet on the conservation standpoint, there are two ecosystems especially valuable. Limestone Mountains are inhabited by species of Delacour's Langurand and numerous precious flora and fauna. Meanwhile, the swamp ecosystem is home to conserve of typical flora of Red River Delta, and waterfowl migrating from the north. In particular, locating adjacent Van Long Nature Reserve is an ecological service complex with complete living facilities, which was built on the basis of the harmonious combination of Western modern architecture and classical Oriental architecture, especially the architecture of Hue Ancient Capital and the traditional villages in Red River Delta. It is promisingly an ideal stop for lovers of unspoiled nature. 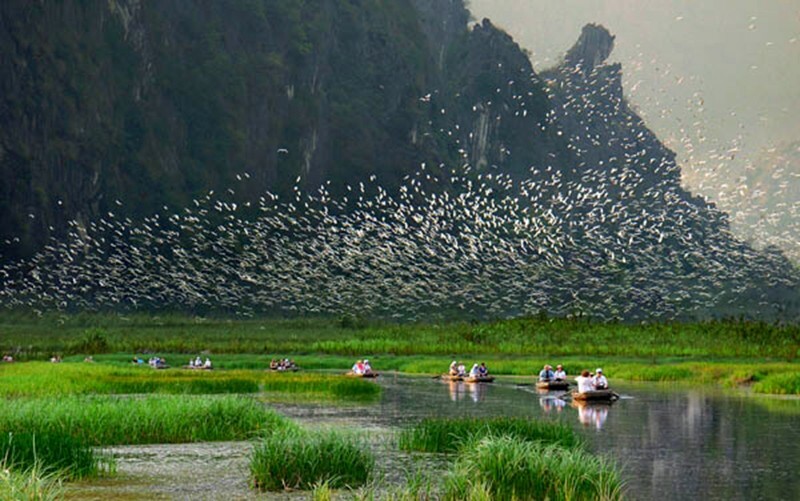 Van Long is considered as a unique and appealing eco-tourism attracting the large number of tourists, contributing to promote Ninh Binh tourism to international friends.